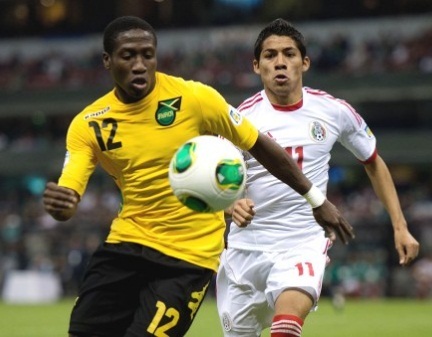 Jamaica achieved one of the most impressive results in its footballing history on Wednesday, drawing 0-0 with Mexico in the opening match for each in the final round of CONCACAF World Cup Qualifying for Brazil 2014. After seven straight losses to the CONCACAF powerhouse in Mexico City, the Reggae Boyz captured its first-ever point at the renowned Estadio Azteca on the strength of outstanding play from goalkeeper Donovan Ricketts and a well-implemented game plan that kept Mexico largely at bay. The result should not come as a complete surprise. In their last World Cup Qualifying encounter on October 11, 2008, the Jamaicans defeated visiting Mexico 1-0 in Kingston thanks to a first-half goal by Ricardo Fuller. Arguably, the best chance of the game fell to Jamaica in only the 8th minute. Garath McCleary delivered a cross from the right that his Reading teammate Jobi McAnuff managed to direct towards the goal and off the post. The rebound came back to McAnuff, who —with the goal at his mercy – took a shot that Mexico goalkeeper José de Jesús Corona raced back across the goal mouth to save. The host started to assert itself more in the following minutes with Giovani Dos Santos coercing a stop from Ricketts and Andres Guardado spraying a speculative attempt over the crossbar from 25-yards out. Just before the half hour mark, Jamaica’s Rodolph Austin intercepted a poor throw-in and sprinted into the left side of the Mexican box. The Leeds United midfielder took a left-footed shot that Corona nonchalantly tipped over the crossbar for a corner kick. Before the break, Mexico’s Jorge Torres Nilo sprung a 30-yard effort that glided past the right post. El Tri came out flying to open the second half, with Oribe Peralta setting up Hector Herrera and then the Santos star went wide himself just seconds later. In the 64th minute, Javier Hernandez forced a tremendous save from Ricketts. Carlos Salcido followed-up swiftly, but he blazed high. Jamaica could have won the game in the 68th off a miscue from Guardado. Ryan Johnson gained possession of the ball in the middle of the field and easily beat Salcido, before his weak shot rolled harmlessly into the waiting hands of Corona. Hernandez had opportunities in the 89th minute and in stoppage time, but headed wide and then saw Ricketts come up big once again. The result leaves both teams on one point, two behind group leader Honduras, which beat the United States 2-1 earlier in the day. In their next qualifiers, Mexico heads to Honduras for a March 22 encounter, while Jamaica – which did not qualify for the 2013 CONCACAF Gold Cup — hosts Panama the same day.